Always wanted to do that *wink* But yes, this week is about an amazing friend I just made…. I started following Luliu on Instagram a while back and the journey so far has been beautiful. Her instastory is forever equipped with detailed steps of her amazing recipes. Fast forward to research night on how to monetize my brand, number 1 on my list was edible gift boxes and I instantly remembered I had seen some really cute ones on the Luliu page…. I immediately sent her a message and she responded so pleasantly with all the advice anyone could ask for….Thank you so much Seyi for motivating me….ooo yes, her name is Oluwaseyi (Luliu is her brand name). I had always wanted to let you all know about her page so this was my opportunity, I asked to feature her on the blog and she said yes! Answer: I am Oluseyi Aliu nee Falade. I’m married with two children. My children are my joy. I also have a very supportive husband. My passion for cooking was borne out of seeing my mum cook, working in her restaurant and learning from her and my grandmum. 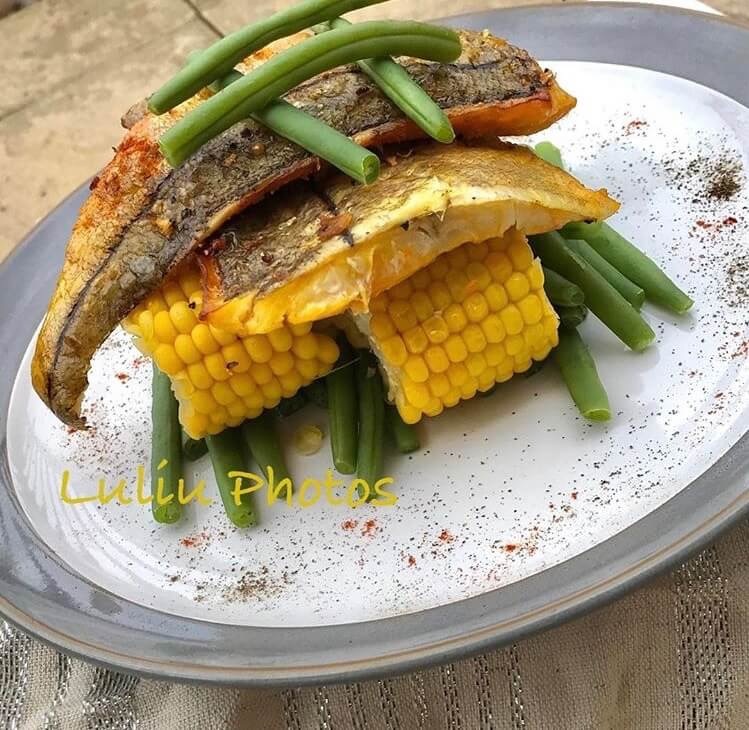 My children are fun and my heart melts when my daughter says “what are we cooking for luliu today mummy?” I guess she is growing to see my passion in the kitchen. She loves to try all recipes and she is my best critic. My son is still too young to contribute but he enjoys the meals and so this encourages me even more. Question: How did you start Luliu? Answer: I started Luliu early this year. I guess after procrastinating for so long I felt the time was right. Being a Christian I also know that this is Gods plan for my life right now. Question: Did you go to culinary school? Answer: I didn’t go to culinary school but I have followed so many chefs for years; Jamie Oliver, Gordon Ramsey, Lorraine Pascale among others. This year on starting my Instagram page, I have developed a broader and wider access to other chefs and it is mind blowing. Presentation is also fascinating. I have lots of cookery books, I enjoy watching cooking programmes but more importantly creating new and different recipes. I think on my feet and a lot of my recipes are definitely borne out of my passion for cooking. I think about going to Le Cordon Blu often, this is a fantasy that I pray could become a reality someday. Question: What is your 9-5 job? Answer: I am a medical doctor. I work in the community as a GP. The journey to becoming a doctor was a challenging one and this makes me appreciate my role immensely. Busy and hectic role but I enjoy it thoroughly. Question: How do you combine cooking and your job plus taking care of your kids? Answer: I guess every working mum has similar challenges. We work hard and juggle everything to maintain a loving home. My passion makes the day longer but I find cooking therapeutic. My present day to day activities require me to be organised so I wake up early and sleep late. I have very supportive mums, both of them are fantastic grandmas and I can’t do all I am doing presently without their support. My husband is supportive. He definitely does a lot which makes cooking easy as when the children need my attention whilst cooking dad is always on hand. Question: What other fun thing do you like to do when you are not cooking? Answer: This question wow. I love reading but haven’t been able to read much lately. I love travelling. I enjoy going to the cinema and having a good night out especially with my girlfriends. Dancing has to be on the cards. Question : What’s your favorite meal to make? Answer: If I can only state one favourite meal then it would be pancakes. I love pancakes. I make this very quickly. It is my go to food and comfort food. Also my children love it. Pancake is so versatile and easy to make and that’s the beauty of it. I look forward to hosting The FoodLover in the luliucuisine kitchen soon. That’s it food lovers….7 quetions and 7 answers that tell it all….Here are a few of her whip ups…. Thanks Ify. What an awesome priviledge. 👍 well done Seyi & thanks 4 featuring her Ify, more power to ur passion!